The cathedral of Guadalajara, or basilica cathedral of the Assumption of Mary Most Holy is a cathedral of Mexico, parish seat of the archdiocese of Guadalajara and one of the most representative buildings of the city, for its towers with neo-Gothic spiers and for its rich history. 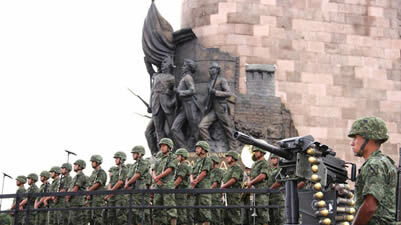 At the height of the revolutionary upsurge, General Manuel Macario Diéguez ordered the construction of two primary schools that would be together, one named Constitución (to the north) and the other Reforma (to the south) on the current Av. Vallarta at its junction with Enrique Díaz de León, These buildings were designed by the engineer Alfredo Navarro Branca to allude to the constitutional theme, whose first stone was placed by the young Enrique Díaz de León, on September 16, 1914. 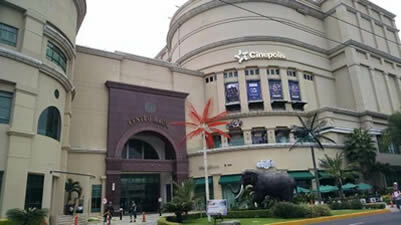 Centro Magno It is a mall of the city of Guadalajara, one of the most important. It is located on Vallarta Avenue. Its location benefits it a lot since this area is one of the best known in the city and with a large number of shops. La Minerva is a representative monument of the City of Guadalajara, in the state of Jalisco, Mexico. The fountain is adorned with a statue of the Roman goddess Minerva (Athena in the Hellenic culture), work of the sculptor Joaquín Arias. 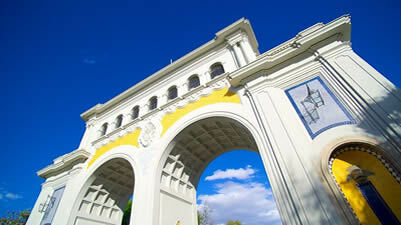 It is the second largest source of the city after the one inside the Mayor park. The work was carried out during the period of the governor Agustín Yáñez, who commissioned the project to the architect Julio de la Peña, and it was inaugurated in 1956. 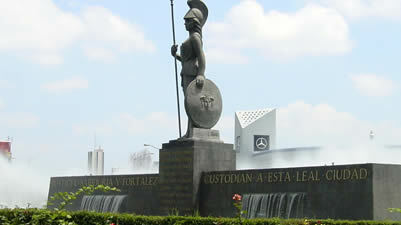 This monument, represents the foundation of the city and the Coat of Arms of Guadalajara in the year of 1542. 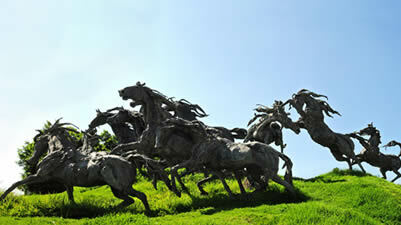 It is made of bronze and represents the escape of 14 horses, artistically very well achieved the dynamics and action. It was designed and elaborated by Jorge de la Peña. Because the city of Guadalajara maintained its main businesses in the center, the idea arose to imitate the large malls of the United States to attract businesses and services to this area of ​​the city. At first the idea was considered vain and without future, but today we know that Plaza del Sol has become one of the meeting places for many Tapatios and tourists, since the area where it is located was consolidated as the most attractive and better location. 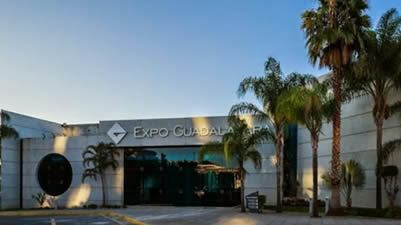 Today in this area are located the best hotels in the city, the Expo Guadalajara exhibition center. 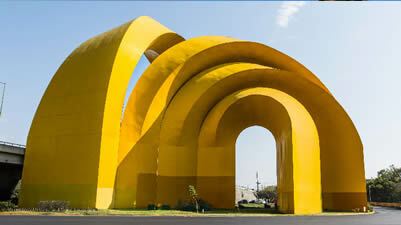 The Arcos of the third millennium, commonly known simply as Arcos del Milenio, is a sculptural work by the Mexican artist Enrique Carbajal González known as "Sebastián", which is located in the city of Guadalajara, Jalisco, in western Mexico. The Raúl Anguiano Museum was renovated in 2003 as a project to protect and exhibit the work of Raúl Anguiano. Its mission is to investigate and disseminate the aesthetic values ​​of the visual arts, both local and external, giving room for new expressions and participating actively and effectively in contemporary artistic practices. The famous Monument to the Children Heroes is a sculpture by the artist Juan Olaguíbel. It consists of a circular esplanade, in the center an imposing column of 50 meters high, at the top a female sculpture representing the Homeland. At his feet the national shield, and in front of this the statue of the Heroes Children with the legend "They died for the Fatherland". Today the United States Consulate General in Guadalajara is responsible for consular services for the states of Jalisco, Aguascalientes, Colima and Nayarit, while the Office of Public Affairs and Commerce also work in Guanajuato, Michoacán and Sinaloa. We have more than 80 Mexican employees and 35 American officials who work for the Department of State, Commerce, Agriculture, Anti-Drug (DEA), The Federal Bureau of Investigation (FBI) and the Social Security Administration. The Expiatory Temple of the Holly Sacrament is a catholic temple dedicated to the Holly Sacrament, located in Guadalajara, Jalisco, in Mexico. It is neo-Gothic style and considered the greatest work in its style in Mexico. Its construction began on August 15, 1897 and ended 75 years later in 1972. The Santos Degollado Theater is a mid-nineteenth century building, located in the Mexican city of Guadalajara. The building is the usual setting for recitals, concerts, classical and contemporary dance performances. 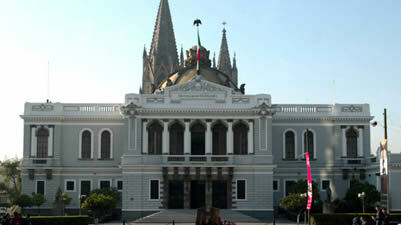 It is also the headquarters of the Philharmonic Orchestra of Jalisco. Hospice Cabañas is a neoclassical building, emblematic of the Mexican city of Guadalajara. It served as a home for orphans from 1810 to 1980. Inside are some of the most important murals of José Clemente Orozco. It was declared in 1997 Patrimony of the Humanity. The building constitutes a historical testimony; when crossing the access door to this museum, the user staff is faced with a clearly Porfirista construction, consisting of three bodies, one central that stands out to the other two, with two sentry boxes flanking the entrance. The upper part with its frontispiece in the shape of an eagle with outstretched wings. The other two bodies are long and wide. The building as a whole has large windows and topped with loopholes at the top. Plaza de la Bandera is a roundabout or road that previously marked the division between the beginning and the end of Guadalajara. It looks like the islet where the same eagle of the National Shield rests, imposing, golden and huge to remind us that this is Mexico. The passion, tenacity and experience of more than 70 years have translated our vision into dozens of international awards for the quality of our products and their presence in more than 50 countries. Founded in 1954 in a beautiful residence of the seventeenth and eighteenth century that belonged to the rich and famous landowner Francisco Velarde, nicknamed the "Donkey of Gold" originally from La Barca, who was General in the Government of Santa Anna and shot for supporting the second empire . In this corridor, an important number of galleries where you can find local handicrafts, but also artisans from around the country as cardboard and wood alebrijes, figures of various materials such as tin or corn and innumerable forms and can be found. uses of pieces of blown glass in addition to furniture and lamps with wrought iron. Parián of San Pedro Tlaquepaque is an attraction in the center of the municipality because it enjoys a family atmosphere, among its qualities it emphasizes that regardless of the day and time, the traditional atmosphere is lived and breathed in every corner. The Cultural Center is a space for the realization of cultural, institutional, academic events, conferences and workshops. The venue offers concerts, plays, congresses, art exhibitions, among other activities. The TlaquepArte exhibition is the venue, the National Prize of Ceramics, among other activities. A place where you will find all kinds of crafts from the best craftsmen of Tlaquepaque. Its construction began around 1742 and concluded 16 years later, and built in stone factory. Its original use was the school-seminary of Mr. San José. During the War of Independence, it was the headquarters of the insurgent troops and the jail of Spaniards. Museum in an old palace with furniture and antiques, as well as concerts, recitals and exhibitions. The traditional Temple of San José de Gracia, in Guadalajara, is located on the Fray Antonio Alcalde Avenue at its junction with Reforma Street, in the heart of the Perla Tapatía, and although today, like all the temples in the city center, he suffers from the lack of a fixed community, devotion to his Patron Saint keeps him in force. This building was buid in the distant 1733 to be a convent of the Augustinian nuns of Santa Monica. 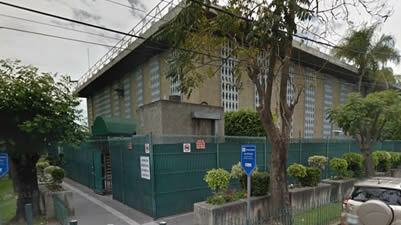 Over time it had become the headquarters of the Seminary of Guadalajara, house of teaching future priests, but since 1914, in full revolutionary fray, the Constitutionalist Army of Alvaro Obregon occupied it and installed a military barracks. And its military vocation extended during almost a century, until it was not social memory of the religious origin. At present it is a museum on the occasion of the Bicentennial of Independence and the Centennial of the Revolution. Located in San Felipe and Contreras Medellín streets, in the Historic Center of Guadalajara, the San Felipe Neri temple is an example of Baroque architecture in Guadalajara. The façade, which houses the images of San Felipe and San Francisco de Asis, is carved in the Plateresque style, and crowned by a pompous tower, is considered by architects as one of the most precious religious sites in the West of the country. It is located in the central ridge of Av. Federalismo, where the old street of the Moor was located, (located in this street the temple), which was enlarged to open the avenue, respecting this religious edification. The construction of the temple was completed in the year 1900 and next to it was the convent of Franciscan Tertiaries that cared for repentant women, orphans and the elderly. The Mezquitán pantheon, located on Avenida Federalismo Norte 977, in Colonia Mezquitán de Guadalajara, opened its doors on November 2, 1896 before the saturation of the Bethlehem Pantheon. This pantheon is settled on an area of ​​approximately 25 thousand hectares in the vicinity of what is today the first square of the city. Begin your adventure and enjoy the incredible experience with your family and friends in one of the most important and modern aquariums in Mexico in Guadalajara. Meet the most representative species of our country in an interactive and fun space, you will see sharks, rays, axolotls, otters, chameleons and many more! Elevated bronze monument of Christopher Columbus in which he holds nautical instruments and a globe. Plaza Patria is a shopping center that is located in the Municipality of Zapopan within the Metropolitan Area of ​​Guadalajara, this plaza as any shopping center has a large number of stores of various types such as: toy stores, furniture, optics, aesthetics, stationery , gift shops, clothing stores, pet stores among many other things more. Neocolonial building, built with gray quarry in 1942. Located in the heart of the historic center of Zapopan, originally worked as a school, and since 1968 as the seat of the municipal presidency. The Basilica of Zapopan and the Convent of Our Lady of Expectation of Zapopan is a Franciscan sanctuary located in the heart of Zapopan in the state of Jalisco, Mexico, it is the second most visited Marian precinct in the state. Opened in 2002, the MAZ is housed in the building designed by the architects María Emilia Orendain and Enrique Toussaint. It was created with the purpose of spreading the expressions of contemporary national and international art. Plaza de las Américas or Plaza Juan Pablo ll is one of the attractions next to the basilica, in the center of Zapopan. This square was remodeled some years ago; its fountains, planters and even the kiosk is new, maybe it used to look more like a 'town square' but to me, if I liked it, it's change. And it should be noted that they kept a piece of the old square. Los Arcos de Zapopan is a colonial style construction of almost 20 meters high that represents the entrance to the municipality. Designed by the architect Guillermo González Ibarra and his wife, the sculptor María del Carmen Rábago. 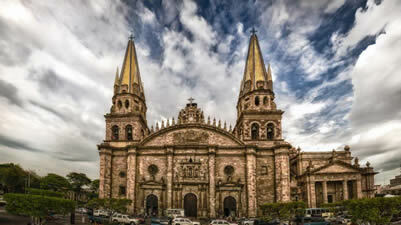 The Corona market is located in the downtown area of ​​the city of Guadalajara, Jalisco, Mexico. 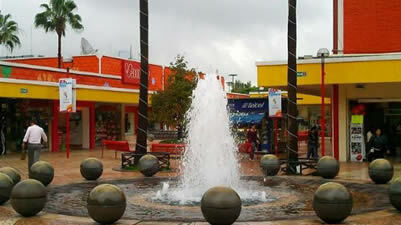 It is considered one of the most important shopping centers of the Historic Center of Guadalajara. Its construction began in 1888 by mandate of Governor Ramón Corona, who was killed before the opening of the market which was on September 15, 1891, which is why the City Council decided to name it 'Mercado Corona'. This property has suffered several fires during its history in the years 1910, 1919, 1929 and 2014. Park that receives its name in tribute to the general Jose Maria Morelos and Pavón del that shows perhaps one of its better sculptural representations that have become of the caudillo: a casting in size to Morelos bronze riding on horse on a pedestal of marble and quarry visible from the Calzada Independencia. In addition to being known as the site of origin and boom of the traditional shaved snows, delicia tapatía, Parque Morelos is considered one of the main lungs of the East of the city as it is populated by centenary trees of great height and copious foliage, degree of being appointed by locals as 'Le bois D'Boulogne' (the forests of Bologna) of Guadalajara. For 1968 and taking advantage of the fact that the city was the site of the Olympic Games that took place in the country, this monument was built and recently retouched on Calzada Independencia, one of the main arteries of the city. It is the Olympic Fountain that is located at the junction of Monte Caucasus and that adorns the long journey that carries the Macrobús transport and that can be accessed by a pedestrian area that is on one side of it. With a capacity of 55.020 spectators, the Jalisco Stadium was inaugurated on January 31, 1960, and has hosted the 1970 World Cup and the 1986 World Cup. It is currently the home of the Atlas teams of the First Division, and the Black Lions of the University of Guadalajara of the Liga de Ascenso. It was also the home stadium of Guadalajara (1960-2010), Oro (1960-70), Nacional (1961-65) and Jalisco (1970-80). It is the third largest stadium in Mexico after the Estadio Azteca and the Estadio Olimpico Universitario. The bullring 'Nuevo Progreso', formerly 'Monumental de Jalisco', was designed to accommodate 16,561 spectators on a total land area of ​​60,000 square meters. The architectural project was entrusted to the architect José Manuel Gómez Aldana for construction and the construction was carried out by Constructora México, S.A. of C.V. whose director was the architect Leopoldo Torres Águila. 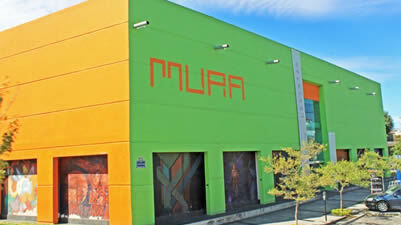 Plaza Independencia is the largest shopping center in the northern area of ​​Guadalajara, located on the Independencia and Periférico Norte road, a short distance from the Huentitán ravine. A particular feature of this shopping center is its folkloric style, which gives us the feeling that we are in a municipal square in some town. The Huentitán canyon is considered a biogeographical corridor since it contains four types of vegetation: tropical deciduous forest, gallery forest, rupiculus vegetation and secondary vegetation. There are also several endemic species of flora and fauna in the area, the canyon is frequented by national researchers and international since it harbors a great biological diversity due to its geographical location. On June 5, 1997, it was declared a Natural Protected Area, under the category of Zone Subject to Ecological Conservation, in the entire area belonging to the municipality of Guadalajara since it is in this area where its most urbanized stretch is located. Place of traditions, legends and history, ideal for meditation and observation, since it is considered a natural observatory from which a beautiful panorama of the four cardinal points can be seen. Tonalá, comes from the Nahuatl word Tonallan which means "place where the sun rises". This municipality of the Metropolitan Zone of Guadalajara is distinguished by its pottery activity, which it has carried out since the pre-Hispanic era and, where every Thursday and Sunday from 8 a.m., more than 3,500 handicraft merchants set up between Juarez streets, Madero, Cruz Blanca, Santos Degollado and Avenidas Tonaltecas and Tonalá, to form one of the most famous artisan tianguis in the country. Tonalá, is recognized nationally as one of the most important craft centers in Mexico. Place where pottery, wrought iron, ceramics and blown glass among other materials are transformed into skilled artisans to form real gems and works of art. * IMPORTANT. TONALÁ route has two starting points. 1.- Leaving from the Rotunda of the Jalisciences Ilustes will go through all the points marked on the map. 2.- Departing from Tlaquepaque (Craft Plaza) you will only visit Artisanal Tianguis (Thursdays and Sundays) and Locals with Typical Crafts.